On 22 June 2007, the former Minister for the Environment and Climate Change, Ian Pearson, announced the new arrangements for the Environment Agency's overview role on the future management of coastal erosion and sea flooding in England. The Minister's announcement included a statement on the proposed arrangements for the coastal strategic overview. The statement included the intention that coastal groups should become more strategic and play a stronger role in the future planning of flood and coastal erosion risk management. Coastal groups will become fewer, to form bigger and more strategic groups. They will have consistent terms of reference and membership and will have a strong Environment Agency input. The new coastal groups should commence from 1 April 2008 and be effective by October 2008. 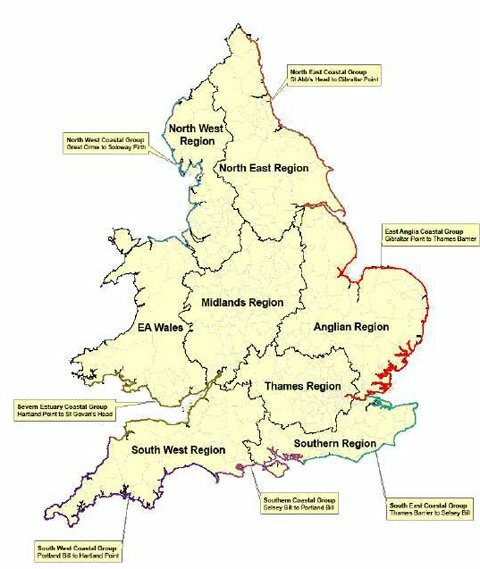 The following diagram outlines the new coastal groups arrangement. However, prior to this new arrangement there were around 17 coastal authority groups around the country, overseeing the SMP2 review process. If you are interested in in a particular area, click on the map and it will open the relevant web site giving SMP progress details in that area.